Why Does My Pit Bull Have Bumps on His Head? Pit bulls and other short-haired dogs may have bumps appear on their heads from time to time. The bumps may be in the top layer of the skin similar to pimples. They could be in the hair follicles or under the skin. Some bumps can form just below the skin, and others can form on the bones or in other tissues. Because there are so many reasons a dog may have bumps on its head, it is a good idea to discover the underlying reason so you know whether the problem is benign or a potential medical problem. Troubleshooting pit bull skin bumps can be a daunting task and may require professional help. Bumps on a pit bull puppy head that seem to be on the the surface of the skin may be caused by bug bites. Mosquitoes, wasps, bees, fleas, ticks, mites and other stinging insects can leave welts on the skin surface. Because these are covered by the dog's fur, you may not see the redness, but you will be able to feel the bump. This kind of bump should heal quickly. If your pit bull is allergic to these insects, however, you will see new bumps forming almost as quickly as the older ones heal. You will also notice excessive scratching. Pitbull info and Training says food allergies also cause skin surface bumps and itching. You may have to change the dog's diet to eliminate common allergens and determine what your pit bull is allergic to. Lack of specific nutrients can also cause skin problems that may present as bumps. Adding nutritional oils can help if this is the problem. Castor oil or fish oil can be helpful, as can olive oil. Add oils slowly to avoid digestive upset. 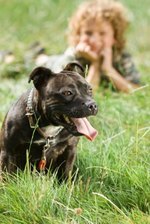 If your pit bull has been wrestling and playing with another dog, bumps on its head could be due to physical contact or play-gnawing. Bumps that appear to be more deeply imbedded in the skin may have a number of causes. Some of these could be caused by abscesses or infections in the skin. These will have to be treated by a veterinarian, who will remove pus from the infected area and treat the pit bull with antibiotics. Cysts caused from clogged sweat glands can also cause bumps on the head. There could be follicular cysts or granulomas. These may be similar in appearance to bumps caused by Cuterebra fly larvae or other parasites. These forms of cysts and skin bumps must not be squeezed. They can cause severe skin reactions. Because you cannot tell what is causing these bumps just by looking at them, take your pit bull to a veterinarian to determine the cause and treatment. A big bump on top of a dog's head could simply be the occipital bone. This is part of the bone structure of the head. Unless it is overly large, there is no reason for concern. The occipital bone is more prominent in some pit bulls than others. A large occipital bone is not desirable for showing the pit bull. If the occipital bone is very large and prominent, however, you may want to have your veterinarian check to make sure a bone disease is not present. If your pit bull has bumps on the head that are draining, bleeding or large, or do not go away within a few days, seek medical help. Some lumps and bumps can be signs of significant and serious disease conditions that will have a better outcome if you get veterinary intervention early. Waiting to take your pit bull in for diagnosis can allow these conditions to become life-threatening.